With the damage from record-breaking torrential rains continuing to spread in western Japan, more than 20,000 people remain stranded in Hiroshima, Ehime and Kochi prefectures on Wednesday, as local roads have been cut off or closed because of landslides, among other reasons. As of noon on Wednesday, 169 people had died in 12 prefectures and 79 people were missing in seven prefectures, according to information compiled by the Yomiuri Shimbun. Local governments are transporting food and water to isolated areas by helicopter and boat. However, completing restoration work and returning afflicted areas to normal is expected to take longer than initially thought. According to data compiled by Hiroshima, Ehime and Kochi prefectures as of Tuesday afternoon, those stranded due to severed roads included about 20,000 people in about 10,400 households in Kure and Takehara, Hiroshima Prefecture; about 75 people in about 40 households in municipalities including Seiyo and Iyo in Ehime Prefecture; and about 230 people in about 150 households in municipalities including Aki and Otoyo in Kochi Prefecture. The Okayama prefectural government had not yet confirmed official figures. The surface of a prefectural road in the town of Otoyo leading to three communities deep in the mountains collapsed, cutting off 58 people in 39 households. In one of the communities, residents had no electricity. Local government officials and others delivered food and water to the residents on foot. It will take at least two weeks to restore the road, according to the local government. In Kure, where almost all of the isolated areas in Hiroshima Prefecture were located, the city government delivered food and water by boat to residents in the Yasuura district and other areas, with support from the Maritime Self-Defense Force and other entities. In Seiyo, as roads were cut off by landslides, 71 people in 38 households in two communities were isolated. According to the Land, Infrastructure, Transport and Tourism Ministry, as of 5 a.m. Wednesday, due to landslides, road surface collapse and for other reasons, the roads mainly in the Chugoku and Shikoku regions that were closed to traffic included eight sections on eight expressways, including the Sanyo Expressway, 83 sections on 48 national highways, and 632 sections on prefectural and ordinance-designated city roads. 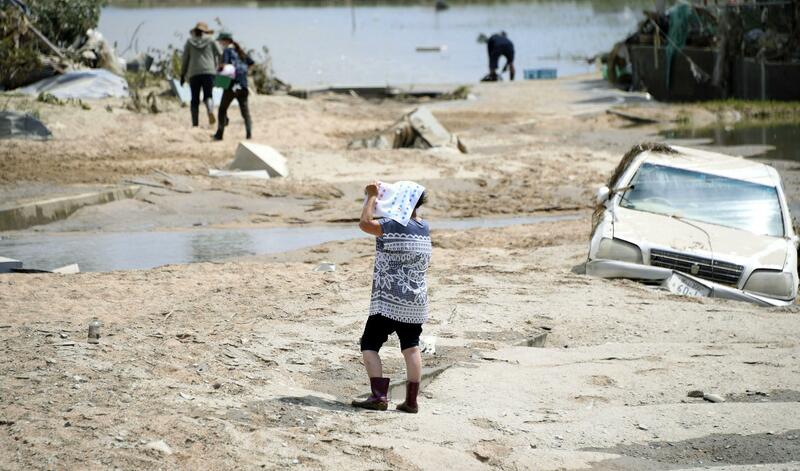 Meanwhile, the disaster response headquarters of the Okayama prefectural government said on Wednesday that 26 people were newly missing in the Mabicho area in Kurashiki, in which 48 people had died after many houses were flooded. Before then, only one person had been reported missing, according to the headquarters. As a result of information gathering by related organizations, including the city government, police and fire and disaster authorities, the figure has significantly increased. According to data compiled by the Fire and Disaster Management Agency as of 5:30 p.m. on Tuesday, at least 386 evacuation centers had opened and 8,049 people had been evacuated in 15 prefectures. The number has been going down as electricity and other infrastructure are restored. On Wednesday, various parts of western Japan recorded 30 C or higher temperatures. As of noon on the day, the temperature in Ozu, Ehime Prefecture, was 34.2 C and in Hiroshima it was 31.8 C. It is important to take measures against heatstroke while search and rescue operations outside are being conducted and at evacuation centers. Published: July 11, 2018, 2:42 p.m. Updated: July 11, 2018, 9:21 p.m.